Finished in an bright eye catching Lime Green with Upgrade Alloys and Carbon Pack this high performance VXR is simply stunning. Comes very well equipped and will give you the ultimate driving experience with its 202 BHP perfomance. 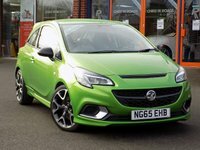 Its excellent specification includes Bluetooth, Cruise Control with Speed Limiter, Recaro Front Sports Seats, Xenon Headlights, Rear Privacy Glass, Vauxhall On Star, 18" Bi Colour Alloy Wheels and the Carbon Pack Upgrade. Please ask for details of our fantastic finance and warranty packages, subject to status, T's and C's apply.